Rincon Elementary School (RES) in Effingham County, GA, is a Schoolwide Title I school located in a rural area in southeast Georgia. RES has been using iLearn for several years and has achieved exceptionally large gains in student achievement on the GA CRCT by focusing on grades 4 and 5. 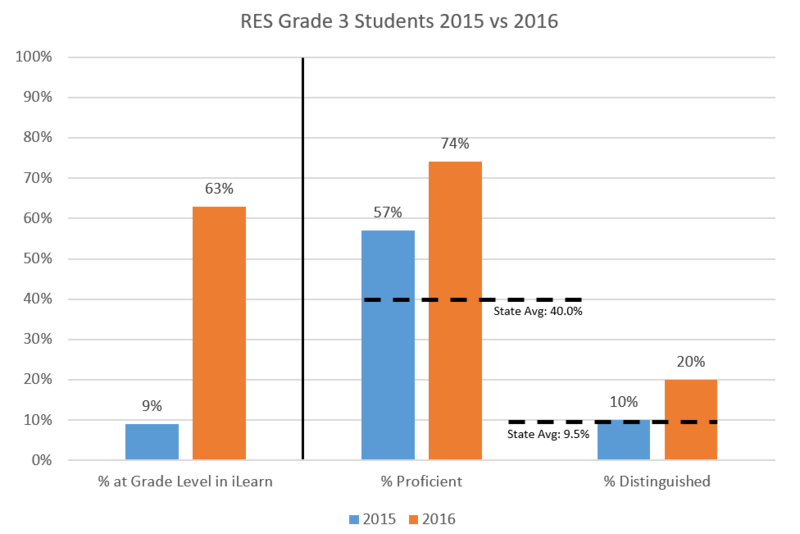 In 2016, RES significantly increased the usage and fidelity of usage for its students in grade three. After using it sparingly for all its 3rd graders in 2015, averaging only 16 hours per student, they used it for 85% of 3rd graders in 2016, and averaged 41 hours per student. They achieved the goal of “full fidelity” with 54 of its 77 students in grade 3 using iLearn. This represented an opportunity to evaluate the impact of the increased use of iLearn Math on the Georgia Milestones, the new end of grade assessment used by the state of Georgia starting in the 2014-2015 school year. With any math support program, the fidelity with which it is implemented has a critical impact on success. Most technology-based math support programs specify “fidelity” as a number of hours per week, day, or year. iLearn defines “fidelity” differently. iLearn uses a different approach – a “foundation building” approach to math support. With this approach, students’ needs (or gaps) below grade level are systematically identified, by grade level, with diagnostic, curriculum-based measures. Each gap is then addressed in sequence, starting at the lowest grade level and working upward. Explicit instruction and systematic practice and review are provided on each topic, and students are required to achieve mastery before advancing. The goal of the program is for each student to fill all gaps with mastery through the end of their enrolled grade level. In this case, it’s grade 3 for the 3rd grade students. So, when using iLearn, “full fidelity” is defined as using the program appropriately, with students reaching the end of their grade level. The hours of use are important, but how far the student advances has the most impact on student performance. The impact of using iLearn with full fidelity is shown below. From 2015 to 2016, RES achieved a substantial increase in the percentage of 3rd grade students using iLearn Math with full fidelity. This increase is shown in the left panel of the graph above (to the left of the black vertical line). As shown by the blue bar, in 2015, only 9% of third graders achieved full fidelity. In 2016, (the orange bar) the increase in hours of use resulted in 63% of students using iLearn with full fidelity. The impact of increasing the percentage of students who used iLearn with full fidelity was exceptional. The results are shown to the right of the vertical black bar above. The data represent the performance of all the school’s third graders (not just the students who used iLearn). In 2015 (blue bar just to the right of the black vertical line) shows that 57% of third graders scored at the “Proficient” level, vs. the state average of 40% (shown by the dashed line). 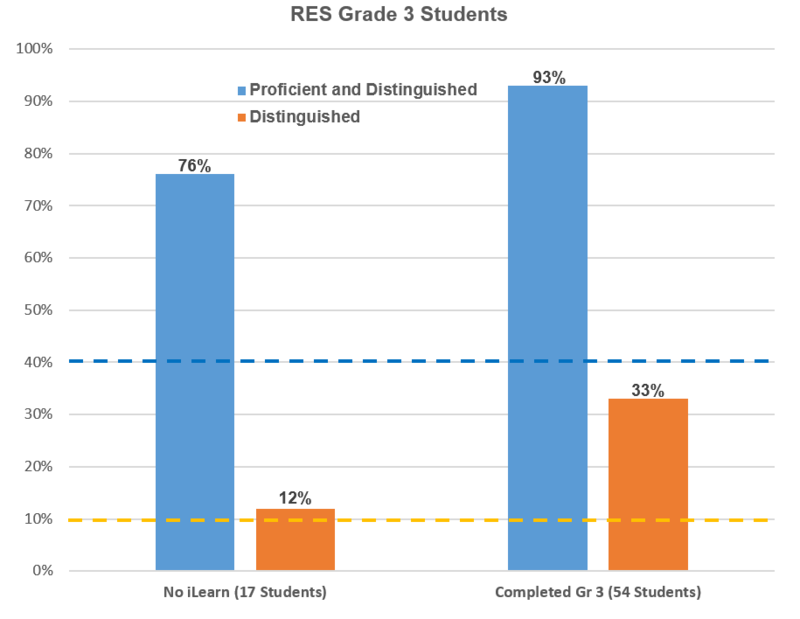 In 2016 (the orange bar in that pair) shows that 74% of 3rd graders scored at the Proficient level, an increase of 17 percentage points for the third grade as a whole. In addition to this gain, there was a substantial increase in the percent of students who scored at the highest level on the test, the “Distinguished” level. As shown in the pair of bars on the right, the percentage “Distinguished” increased from 10% in 2015 (blue bar) to 20% in 2016 (orange bar). The average for the state was 10% of students scoring at the Distinguished level. These very large gains from 2015 to 2016 at both the Proficient level and the Distinguished level can be attributed to the use of iLearn with full fidelity, as shown in the second graph below. This shows data from the 2016 Georgia Milestones test for two groups of 3rd grade students. On the left are students who received no iLearn math support. On the right are students who used iLearn for math support with full fidelity. The difference is very large on both measures. The blue bars represent students who scored at the Proficient level. The orange bars represent the students who scored at the “Distinguished,” or highest level. While 76% of students who received no math support scored at the Proficient level, 93% of the students who used iLearn math with full fidelity scored at the Proficient level, an increase of 17 percentage points. Similar results were seen in the students who scored at the Distinguished level. Among the students who received no supplemental math support, the percentage at the Distinguished level was 12%. The state average was 10% (the orange dashed line). Among the students who achieved full fidelity using iLearn, the percentage scoring at the Distinguished level was 33%. This represents a 21 percentage point increase. These differences are directly related to the increases reflected in the first graph for the overall improvement in 3rd grade scores from 2015 to 2016. The overall scores improved as a result of the gains for students who used iLearn with full fidelity.